Title in Spain: "El verano del pequeño San John" which, again translated into English would be "Little Saint John's summer". 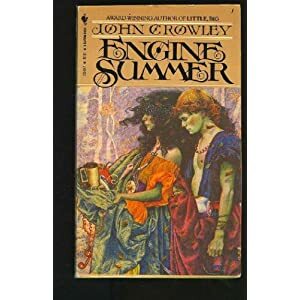 The title (Engine Summer) is a pun on "Indian Sum-mer" and, indeed, the culture that emerges after the disaster that this book describes keeps a vague resemblance to that of North Americans Indians. The narrator is called Rush that Speaks, and other characters have names like Painted Red and Seven Hands, and all of them live together in a peaceful drug using community called Little Belaire. The novel tells the story of a young man named Rush that Speaks and of his wandering through a strange, post-apocalyptic world in pursuit of several seemingly incompatible goals. The story is set in a post-technological future. Our own age is dimly remembered in story and legend, but without nostalgia or regret. The people of Rush's world are engaged in living their own lives in their own cultures. Words and artifacts from our own time survive into Rush's age, suggesting that it is only a few millennia in our future. Yet we are given hints that human society and even human biology are significantly changed. Even such basics as reproduction and eating have been altered, one by industrial-age genetic tampering, the other by contact with extraterrestrial life. Rush comes of age in Little Belaire, a mazelike village of invisible, shifting boundaries, of secret paths and meandering stories and antique bric-a-brac carefully preserved in carved chests. The inhabitants are divided into clans called cords based on personality traits. Over the centuries, the people of Little Belaire have perfected an art which they call truthful speaking: communication so clear and accurate, so "transparent", as to leave no potential for deception or misunderstanding. Perhaps as a result of this practice, Little Belaire appears to be free of any violence or even serious competition. Another result of truthful speaking is the existence of the saints, those whose stories speak not only of the specifics of their own lives, but about the human condition. Yet even with the benefit of truthful speaking, secrets and mysteries remain. Rush's journey is set in motion when the girl he loves, Once a Day, elopes from Little Belaire to join another group, an enigmatic society called Dr. Boots's List. In his search for her, Rush befriends a hermit and an "avvenger" and shares the secrets of the List. Ultimately he discovers a transparent sainthood stranger than any story told by the gossips of Little Belaire. A thousand years after the Storm, which destroyed the industrial society, survivors are divided into isolated communities, with their own and tiny cultures. Little Belaire is an enclave of "Truthful Speakers" who practice an ethic of total openness and mysticism fueled by intoxicants, and a serpentine style of life and conversation. Nearest neighbors are the people most secretive and puritanical of the List of Dr. Boots, fond of cats, and descendants of a feminist organization that came to announce the end of the world. Rush that Speaks, from Little Belaire, wants to be holy, have a life of transparent texture in which all people can see themselves. So he travels from one place to another, examining the mysterious and unique artifacts created by the "angels ", who now live in cities floating in the sky, sharing the arboreal life of a hermit, rejecting the ways and customs of the List. He meets the Looters, who still revere the remains of technological civilization. Finally he meets Mongolfier, sent by parachute from a place of angels, and records with him the vicissitudes of his own hagiography into eight-sided crystals. And reaches an ironica potheosis: the autumnal acceptance if unhappy consciousness in a book entitled "The Little Summer of St. John" who will instruct the angels -we- on the virtues of the people of the surface. John Crowley (born December 1, 1942) is an American author of fantasy, science fiction and mainstream fiction. He studied at Indiana University and has a second career as a documentary film writer. He is best known as the author of Little, Big (1981), which received the World Fantasy Award for Best Novel and has been called "a neglected masterpiece" by Harold Bloom.